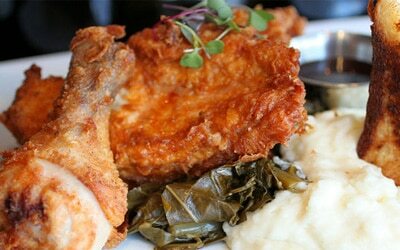 Max's Wine Dive, known for its high-low pairing of fried chicken and Champagne, will open a branch in Atlanta in 2014. Founded in Houston in 2006, Max's Wine Dive is half wine-bar, half comfort-food restaurant. Fried chicken is the signature dish, but the menu also has cutesy items such as the Texas "Haute" Dog, with house-pickled jalapeños and cotija, and Nacho Mama's Oysters --- fried Gulf Coast oysters served on fried wontons and topped with habañero salsa and cilantro. Its grilled cheese sandwich comes on thick Texas toast, with a cup of tomato soup on the side. In addition to the Houston original, there are Max's in Austin, San Antonio and Dallas, with more in the works. Max's Wine Dive, 77 12th St. NE, Suite 6B, Atlanta, GA 30309, no phone. Atlanta restaurateur Tom Catherall has opened SHUCKS Oyster & Wine Bar in the Brookhaven Town Center, making this the third restaurant he owns in the center. SHUCKS features oysters from around the world, gourmet grilled cheese sandwiches, homemade soups and seasonal salads along with craft beers, wine and Champagne. Catherall describes the sandwiches as creative; among them are Shucks Signature 5 Cheese, Jalapeño Cheese Popper and the Deconstructed French Onion Soup Sandwich, which features caramelized onions and Gruyère on French bread with a jus for dipping. Lunch Sat.-Sun., Dinner nightly. SHUCKS Oyster & Wine Bar, Brookhaven Town Center, 705 Town Blvd., Ste. 320, Atlanta, GA 30319, 404-846-1777 . Keith Osborne, Nick Chaivarlis and T. Hunter Jefferson formed HKN Restaurants in 2012, and just a year later launched Ink & Elm with Atlanta-area native Stephen Sharp as executive chef. Sharp figures to change the menus frequently depending on the offerings of local purveyors. Oysters from remote shores compete with tilefish and Sapelo Island clams from closer to home. Asher Blue cheese from Sweet Grass Dairy and WayPoint Camembert from Sandy Springs’ CalyRoad Creamery grace the cheese plate. The wine list doesn’t include local wines, but there are several area-sourced selections among the beers. Ink & Elm sits right across from the main entrance to the Emory University campus. Dinner Tues.-Sun. Ink & Elm, 1577 N. Decatur Rd., Atlanta, GA 30307, 678-244-1541. A sense of humor balanced by a sense of proportion invigorates the menu at Sobban, a Korean Southern Diner replacing Kitsch’n 155. Jiyeon Lee and Cody Taylor, who own popular Heirloom Market BBQ, took the space over and opened October 1. Lee is visible in the kitchen as she speeds from one pot to another. The pair describes a “sobban” as a “small, ornate wooden table used for humble meals during the Lee Dynasty,” (1392-1910). The menu blends Korean flavors with Southern dishes and relies on local ingredients for many items. Korean sweet potatoes (deep-fried) and Korean mustard adorn a fried bologna sandwich topped with kimchi. Deviled eggs sport a dab of kimchi and a spot of crispy fried rice. The place has been a hit from minute one, so plan to get there early for lunch. Lunch & Dinner Tues.-Sat. Sobban, 1788 Clairmont Rd., Decatur, GA 30033, 678-705-4233. On Friday, October 11, 2013, the Southeast’s first and only authentic Belgian-style brewery, Three Taverns Brewery, opened its brewing facility and tasting room for tours to the public. Among its beers, A Night in Brussels is a Belgian-style American I.P.A. ; Theophan The Recluse is a 9 percent Russian Imperial Stout that will launch into the market in the months ahead; and Decatur Ryeson is a collaboration between Three Taverns and Twain’s Billiards & Tap in Decatur. Brewmaster is Brian Purcell, an area entrepreneur with years of experience in beverage industry branding and marketing. Open daily. Three Taverns Brewery, 121 New St., Decatur, GA 30030, 404-600-3355. Referencing the slight pink ring that forms at the edge of a properly cooked barbecued meat, Smoke Ring is a new enterprise from the 101 Concepts group that includes Food 101, Cibo e Beve and Meehan's Public House. Open currently just for dinner, the restaurant will add lunch service soon, and will be open until 1 a.m. Fridays and Saturdays. A native of Lawrenceville, Ga., Jordan Wakefield, who has been with Food 101 restaurants for several years, will head the culinary team. The menu hits all the high points of barbecue, from pulled pork to ribs and brisket to chicken. And don't forget the wings and deviled eggs. Dinner nightly. Smoke Ring, Castleberry Hill, 309 Nelson St. SW, Atlanta, GA 30313, 404-228-6377. Eddie Hernandez, executive chef of Atlanta's Taqueria del Sol, won the top celebrity chef award for the Hot Tamale Cooking Contest at the Delta Hot Tamale Festival in Greenville, Miss. Held this year from October 17-20, the festival is devoted to recognizing the tamale. For his role in the competition, Hernandez produced three kinds of tamales: pork with salsa relish; fresh corn, with poblano chile and cheese; and an unusual dessert tamale, filled with blueberries and golden raisins. Both the pork tamale and the fresh corn tamale will be specials at Taqueria del Sol’s Georgia locations the week of November 4 during dinner service. Hernandez had some stiff and famous competition for the event, including Michael Hudman and Andrew Ticer of Hog & Hominy in Memphis; Donald Link of Cochon and Herbsaint in New Orleans; and Rogan Lechthaler of The Downtown Grocery in Ludlow, Vt. Lunch Mon.-Sat., Dinner Tues.-Sat.. Taqueria del Sol, Westside Urban Market, 1200-B Howell Mill Rd. NW, Atlanta, GA 30318, 404-352-5811. Matt Albertario has been promoted from executive sous chef at Ray’s on the River to the position of executive chef at Ray’s on the Creek. The Chicago native is new to the position at this restaurant but not new to the position itself, having spent six years at Wildfire --- now The Capital Grille --- in Dunwoody in that role. Growing up in an Italian family, Albertario learned a lot from watching his mother and grandmother in the kitchen, he says, and then attended the culinary program at Kendall College in Evanston, Ill. Lunch Mon.-Fri., Dinner nightly. Ray's on the Creek, 1700 Mansell Rd., Alpharetta, GA 30004, 770-649-0064. Canoe has named Matthew Basford as executive chef of the popular restaurant perched on the banks of the Chattahoochee River. Basford has worked at Canoe since 2005 beginning as sous chef, then executive sous chef and finally, chef de cuisine. Born and reared in Australia, Basford worked in kitchens in Angaston and Greenock. In 2002 Basford moved to New Orleans to work at the Maison Dupuy Hotel, and relocated to Atlanta in 2005, finding himself within a week in the Canoe kitchen. Having had a major role in shaping Canoe’s cuisine, Basford plans to continue the restaurant’s style of innovative fine dining, creatively using the freshest seasonal ingredients. Canoe, 4199 Paces Ferry Rd. NW, Atlanta, GA 30339, 770-432-2663.